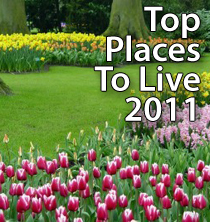 CNNMoney recently released its Best Places To Live 2011 list. The annual survey is based on data from Onboard Informatics. Using Quality of Life factors such as education, crime and “town spirit”, and focusing on towns with between 8,500 and 50,000 residents, the CNNMoney survey ranks the country’s best “small towns”. To be eligible, towns must be have a median household income greater than 85 percent, and less than 200 percent of the state median income; must not be a categorized as a “retirement community”; and must be racially-diverse. From a list of 3,570 eligible towns nationwide, Louisville, Colorado was ranked #1. Rankings like these can be helpful to home buyers nationwide, but it’s important to remember that the Best Place To Live survey is subjective. You may find none of the above towns to be to your liking. You may also find the lowest-ranked city to be your favorite. In other words, before making a decision to buy, connect with a real estate agent who has local market knowledge. That’s the best, most reliable way to make sure you get the housing data that matters to you.